The Newest Generation of Extreme Performance DDR4 is Here! Building on the strong success of G.SKILL Trident series, Trident Z series represents one of the world’s highest performance DDR4 memory designed for PC enthusiasts and extreme gamers. Using only the best-in-class components and featuring luxurious hair-line finish aluminum heat-spreaders, Trident Z series is the state-of-the-art DDR4 solution that combines performance and beauty for PC enthusiasts and extreme overclockers to build an ultra-fast PC or achieve new overclocking records. Designed for PC enthusiasts, overclockers, and extreme gamers, the Trident Z series DDR4 is built with specially screened ICs qualified under the legendary G.SKILL selection process, and rigorously tested for reliability, compatibility, and performance across a wide range of motherboards. Built for the highest performance, G.SKILL Trident Z series memory is the world’s first to bring DDR4 4000MHz to XMP rated speed on the first launch, as well as the world’s first memory to break the DDR4-5000MHz overclocking world record barrier. Trident Z series maintains the aggressive fin design for highly efficient heat dissipation, while introducing luxurious hair-line finish aluminum heat-spreaders. Look no further for a memory that combines performance and beauty for building a stylish, modern PC! No compromises! These extreme speed memory kits not only come in kits of 4GB and 8GB modules; a series of ultra high speed 16GB modules are also available in Trident Z series. Build your dream supercomputer with up to DDR4 128GB (16GBx8) of ultra-capacity at ultra-high frequencies! All Trident Z DDR4 memory kits are tested with G.SKILL’s rigorous validation process on major performance motherboard brands to ensure the best-in-class reliability and compatibility across the widest selection of motherboards. Just set and go. Programmed with the latest Intel XMP 2.0 profiles, the only thing between you and extreme performance is a simple setting. All G.SKILL memory products come with a limited lifetime warranty and the G.SKILL technical team is always ready to provide consumers with complete technical support via online forum, telephone, and email. Each year, iF International Forum Design GmbH organizes one of the world's most celebrated and valued design competition: the iF DESIGN AWARD. Trident Z is a proud winner of the iF Design Award 2016. We offer express delivery to Al Ahmadi, Hawalli, Al Farwaniyah, and other cities in Kuwait for G.SKILL 32GB (2 x 16GB) TridentZ Series DDR4 PC4-25600 3200MHz 288-Pin Desktop Memory Module | F4-3200C16D-32GTZ. 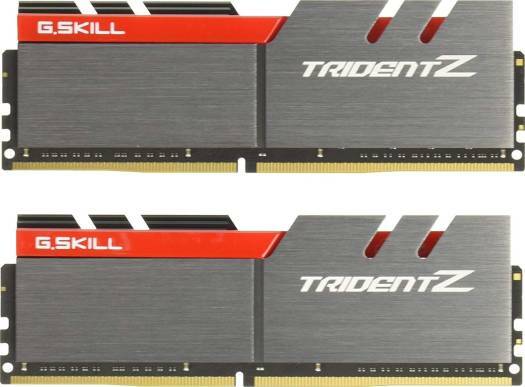 We offer the best price for G.SKILL 32GB (2 x 16GB) TridentZ Series DDR4 PC4-25600 3200MHz 288-Pin Desktop Memory Module | F4-3200C16D-32GTZ in Kuwait. Buy now with the best price!